A flexible tool for exporting/importing Orders from/to Magento. Easily transfer data to another installation or third-party software. If customer data is missing, the extension will restore it automatically from the billing address. 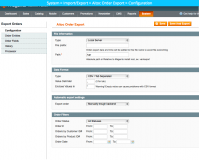 Export/import data when migrating to another Magento installation, ERP system or accounting software. 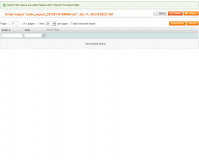 Merge several Magento stores into one with no hassle at all. Restore missing customer data from the billing info. When order data needs to be moved from different Magento instances or third-party systems, ensuring its integrity is a must, as it directly impacts the further business performance. Leveraging the extension, online merchants benefit from automated data transferring mechanism that not only allows to migrate order data fast, but also to monitor and address any possible issues occurring in the process, resulting in a truly high data accuracy and quality. With its smart staged migration algorithm, the module allows to transfer large sets of order data aggregated at multiple stores. The order records from different stores will be split into portions to reduce the load from the system and so ensure fast and fault-free import and export processes. By entrusting order data transfer to a specifically designed solution, e-retailers bring automation to the entire process. This considerably reduces the time spent on manual data handling, also reducing potential human errors to a minimum. 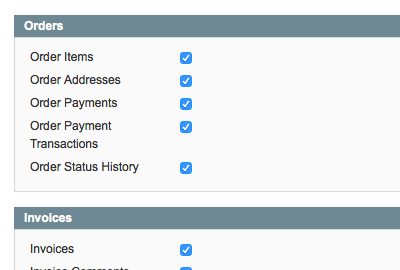 Orders, Order addresses, Order payments, Payment transactions, Order status history. Invoices, Invoice comments or Invoice items. Shipments, Shipment comments, Shipped items, Shipments tracking. Credit Memos, Credit Memo comments, Credit Memo items. Based on Order placement date. Based in Customer ID and/or Product ID. After the checkout is complete. After an invoice is created for all products in the Order. Automatically - upon checkout or invoice creation. Export data via remote FTP or email. Perform automatic export via Cron. 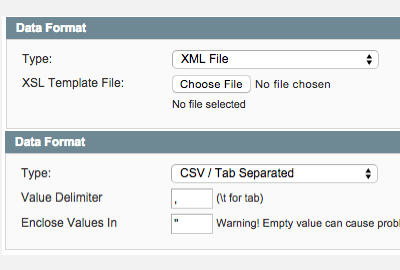 Use CSV/Tab Separated or XML (recommended) formats. Define Order fields to be exported. If an Order is missing Customer data, it’s restored from the billing info. Upload an XSL template file for transferring Orders to third-party software. 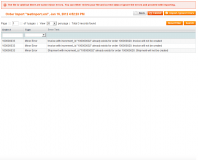 Import Orders to specific Magento Stores. Work with multiple currencies (export / import the base currency and the currency the Order has been placed in). See a history of imported and exported Orders. 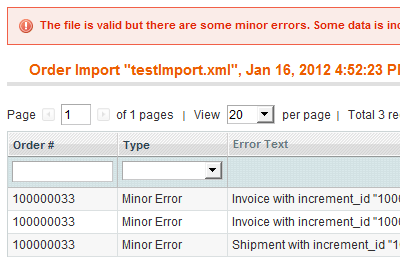 Get a log of errors that occurred during the import. 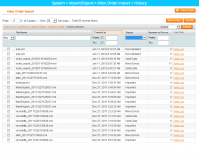 Interrupt Order import is an error occurs. Configure import behavior (add, replace or delete data for matching Orders). 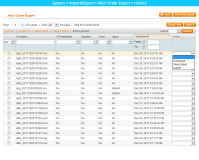 Export only Orders that haven’t been exported yet from a specific selection. If you need to export from Magento Comminuty to Magento Enterprise, and you need two versions of the product - get an automatic discount in the shopping cart when you’re buying both versions of the extension! Order Grid Magento 1 extension – Get a complete view of all orders to improve order management at your store. 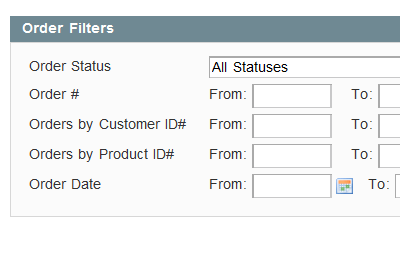 Filter order records by product name or SKU and view order-related information right on a single order list page in your Magento admin panel. Magento Recurring order extension - Make it possible for customers to create grocery lists and place recurring orders for everyday goods. Send emails alerts to buyers reminding them to re-order, allow them to share their product lists, and set up special discounts for repeat purchases. + Added possibility to specify format for the saved file while using XSL. * Adjusted data used in block 'Account Information' in order details when customer is created during import. + Improved the notifications and detailed failure reasons. + The Import File Validation Tool revamped with new list of notifications and the detailed failure reasons. * Fixed the issue with using custom XSL template file for the export into XML file. * Fixed incompatibility with Magento patch SUPEE-6285 for sub-admin with restricted resources. + Compatible with Magento 1.9.1.1. * Issue with customer creation based on billing address during order import is fixed. * Incompatibility issue with Checkout Fields Manager is fixed. * Issue with incorrect date conversion from different magento locales is fixed. * Bug with the configurable products import is fixed. + The extension now works for Magento 1.7.0.1 and Magento 1.7.0.2. * Comments history notes, invoices, shipments and credit memos now all have correct dates of creation after import. * The extension now works correctly with locales other than en_US. * track_number field now appears when exporting order from Magento 1.4-1.5 and importing it to Magento 1.6 and up. * Orders with names containing symbols like ®,&0000195;, are now exported and imported. Thanks for making a great plugin. This is definitely worth the investment! The team was very responsive with questions, and I was able to export orders from a Magento CE 1.4x installation into 1.9.2. The extension works exactly as advertised. If you want to import a large amount of orders, it would probably make sense to break the import down into smaller parts, this way it will go much smoother. Excellent support from the tech team as well! Works as described! And very good support! Good stuff! Great extension, great support, great company. 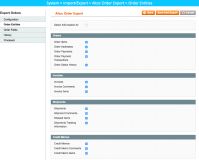 If you need to import/export orders between different systems, this extension is a must-have. It's a time-saver for me. That's a great solution for importing orders to another system. I use ERP for my business and I need to load the orders from my store daily to it. Finally, I managed to find a solution by using this module. Support team helped me to configure the extension and csv format to be understandable by my system. Works like a charm now. One of the best import tool for orders out there. It does exactly what's required. I submitted some feature requests to the support team and they promised to add them to the next updates. Amazing feedback. Thankk you guys for this great extension. Greetings from Italy. Great Extension and support. Saved me a LOT of time. We migrated from 1.7 to 1.9.01 and had few hunderd orders to move over. Worked perfectly. Very simple set up but very effective. Deffinitely recomend. Great tool that creates customers as it imports orders. Great documentation as well. Had one issue and Victor was gracious with his time and support. I use this as well as the product import/exports and all are top notch. Incredibly perfect! The import from Magento 1.4 to 1.9 worked perfectly. It solved us so many issues and was an incredible tool to keep developing the upgraded site, leaving the old online since the last second. Orders match, invoices match, credit notes match, shipping data match and all the comments match too. Honestly we were expecting at least some partial loss of data and it was a surprise to see that all has been perfect and really fast. Thanks to the team for helping us solve a little issue with the installation that was totally our fault. If you are upgrading your site and you can't turn it down for hours and hours, that's the product you need. I am not one to write reviews, however, this module was awesome. I was integrating 2 websites into a third and wanted to keep all the orders, credit memos etc in one place. This extension was easy to use and most of all fast! Thanks! We have been using Orders Export and Import for over 1 year. I use it to export all orders by email to a dedicated email account. I then have another program retrieve the email and import the order details into our dinosaur inventory / order processing software that has terrible order import options. We only had one issue with the software in that time due to some changes at our hosting server and support was quick to help solve the problem. The software itself was easy for me to learn and has every feature I could ask for. Highly recommended! For my client I had to export orders from Magento 1.4 and import them to Magento 1.8. This works perfectly! You will get a logfile before you import, so you can see what might be a problem with the import. Great extension, functioned perfectly in Magento 1.7. Very quick and helpful support. Highly recommend. This extension was very easy to install and very simple to use. The Aitoc support team are extremely helpful and were replying to me in under 5 minutes. I would definitely recommend any product from Aitoc! This is an amazing extension. Easy installation and setup, it can save you time: I was considering to take care by myself of the orders migration between two Magento installations, but after a short time I realized it would be a massacre! :-) After a while from migration I have noticed that it was impossible to place orders and invoices: two nights of debugging led me to realize that logs where full of exception caused by integrity constraint violation on tables related to orders and sales. The bad surprise was that indexes in eav_entity_store were not updated to new order ids, so i had to manually increase them based on the last migrated order/invoice id. It was one of the most difficult bug fix in my career on Magento...I'll not forget easily. Fantastic tool. 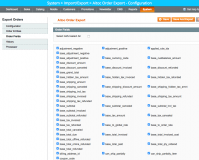 We had to export and import all the orders from the magento db while migrating from one system to another, and this tool did exactly what we were looking for. Look, I was really bummed that I couldn't just dump sql and upload the orders to my clients new site. It seems like a huge disconnect with upgrading Magento platforms. So basically I landed on this site 4 different times wile googling everything I could to get a solution for transferring orders and finally realized im losing myself money waisting any more time searching. So I purchased this extension and it is done within 10 minutes. If you're wondering it if works or if its worth it. Just buy it. You'll keep a clean database for your new install and you'll be done reading the Magento boards looking for migration tips. Take it from a guy who hates writing reviews and never buy extensions from developers I'v never worked with. This one is a diamond in the ruff and Im so stoked im actually writing a review. Well done guys! Thank you Thank you! Amazing extension. We had 50,000 orders we had to find an easy, uniform way to port over from our old platform to Magento. Once we got a template set up to quickly get the CSVs constructed, this extension worked like a charm. AITOC was a lifesiver! A piece of stable code which is based on new methods and functions, no more dataslow :). Instead of the competitors products price and effort are matching. And the most important thing, the support is fast and seems to be pro. I gave 4 stars, but this is clearly a 4,5 with tendencies to 5. Excellent support from Aitoc. We had to move a selection of orders from one complex multi website system to another. Thank you very much! Excellent product and excellent support from Aitoc Support team. I really needed to export all my orders in a few steps. Thank you so much for helping.